If Christmas didn’t bring you an cheeseburger slathered with spicy sauce and topped with fried onions, well, chin up, old boy. The season’s not over yet, and it was waiting to one-up the ball drop on New Year’s Eve. Shake Shack has announced that as of January 1st, 2015, it's dropping the all-new ShackMeister Burger— the first new burger addition since 2012’s SmokeShack. 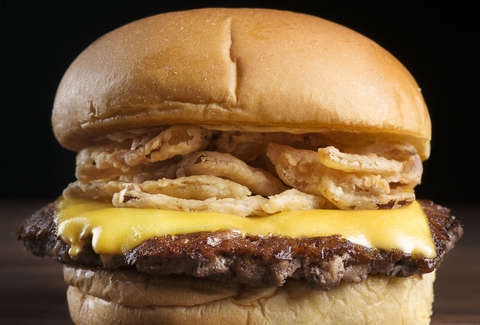 The 100% Angus beef ShackMeister comes with ShackSauce and marinated, crispy shallots. It won the "best burger" Judge's Choice prize at the 2014 Food Network South Beach Wine & Food Festival. That’s right: A Food Network-approved burger will be available, on New Year’s Day, at Shake Shack prices: $6.19 for a single or $8.99 for a double. And because Shake Shack has gone not just national, but international, you can get it in cities like New York, Boston, Philly, DC, Miami, Atlanta, Chicago, or London. But we prefer "AND London." If the $100mil IPO didn’t seal the deal, now it’s official: Shake Shack is Santa Claus. Hannah Serena Goldstein believes that Shake Shack can do no wrong, pretty much, except for that one time it inexplicably changed out the crinkle fries for fresh-cut. She's glad you changed them back, Shake Shack, because otherwise she would have boycotted and called on all her friends to do the same because WTF, THE CRINKLE FRIES WERE PERFECT. Follow her on Twitter and Instagram.